Debashish Paul, Abhijit Kedia and Ganesh Palwe have combined FlashLite and the Accelerometer APIs to bring the iPhone’s touch flow to the Nseries. The application not released yet and is aptly titled “THE NO-TOUCH”. Great work guys! Although I doubt if this will go mainstream as a new flash layout with album art will have to be made for different songs manually (I may be wrong) but still great demo! 81 Pictures Of The N81 Special Edition! A few random shots after the break, for the rest jump over to this Flickr Set, Slideshow Here! S60 wizard Samir has officially released the rotateME beta 5 for the general public! It is one of the most widely awaited applications ever and is compatible with the N95, N95 8GB and the N82 while a special version for N80, N73, E65, N81 is in the works. Beta 5 brings a world of improvements, the biggest for me is the ability to hide the application from the default task manager! This is something I really wanted as it makes the experience complete, it is as if the rotate functionality comes inbuilt! The options to adjust sensitivity and reactivity work well and allow you to control the angle of tilt at which the screen rotates. The auto start option is also present. All in all a complete package. Wonderful work from a great man! Cheers to you mate! In case you can spare it, donate Samir a few PayPal dollars. Nokia continues to release great free applications to go with their S60 phones. The latest in line is the Nokia Internet Radio application, it surprisingly is ‘officially’ compatible with the N95, N95 8GB, N91 and the N82. However it apparently works with most other S60 v3 devices too. Shoutcast playlists come up with a full directory of hundreds of compatible stations and there is no need to search for stations on the net. The quality of the stream at 128 kpbs is great! A must download. Update: I just spent more time with the application and I also really liked its UI and ease of use. The streaming quality can also be selected according to the connection you are using to connect to the servers. Neat! Finally! 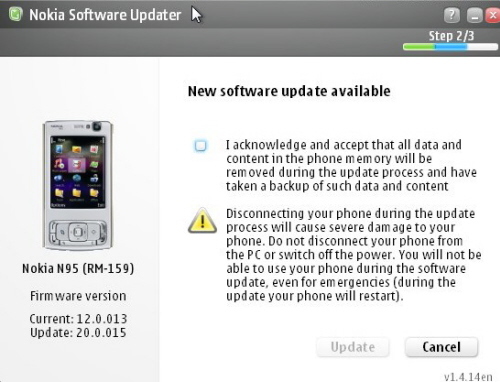 The latest and perhaps most awaited firmware for the N95 is here, as a result of which it has hit v20.0.015. The firmware as usual brings us some bug fixes and improvements, but this time the improvement is huge! It includes demand paging, 30MB plus free RAM after booting, speedier operation, N-Gage support, faster camera software, integrated Search, modified Welcome apps and then some more and yes, the keypress bug is gone. Below is somewhat of a changelog. ‘Real’ Youtube & More On The New N95 Firmware! Update: The New Firmware is out. – A new lease of life for the N95! I personally can’t wait! For screenshots and more look here and here.